Buying a new home is a big moment in most people’s lives. Nothing else quite gives the feeling of having planted down one’s roots and a sense of accomplishment than a home purchase. A home is a big investment, and one of the first things that we have to do is to protect it with fire insurance (which protects against fire damage to building structures) as well as other home insurance that protects the contents in the home (such as Etiqa’s eProtect home). Our home is our pride and joy – a place of warmth and a place we can retreat to after a hard day at work. We would want to do it up, decorate and personalise it to taste. For first-timers, home renovation can be a daunting process. Here are some basic tips to help you along. Before getting to the fun part of home renovation, you’ll have to put yourself into a disciplined frame of mind and set a realistic budget. There are online tools that can help you estimate how much your home renovation would cost. Renovation costs for a 4-room HDB apartment averages about $50,000, and may range from $30,000 to $80,000. These are substantial amounts, which is why it makes sense to protect your investment with good home insurance. Ready-made cabinets and shelfs rather the custom carpentry – Carpentry works can account for nearly half of overall renovation costs. Ready-made ones may not be bespoke, but can cost just a fraction of custom-made ones. Flooring materials – Flooring can make up about 20% of typical renovation costs, so if you’re on a budget, materials like laminate are more wallet friendly. Granite and marble can cost 3-5 times more on a per square foot basis. Painting vs wallpapers – Using wallpapers is more expensive compared to painting. Wallpapers cost an average of $300 per roll, excluding installation costs. This is significantly higher than the cost of a tin of paint coming in at around $25 a litre. Wallpapers are also subject to peeling and are more difficult to maintain over the longer term. This next stage of the home renovation process is arguably the most fun. Go online or pick up glossy magazines to research on décor styles and be inspired. Sites such as Qanvast and Home and Décor are fantastic resources for style research, as are home décor-related accounts on social media site Pinterest. Decide on what suits your tastes. Do you like the minimalist look? Or something eclectic? Or do you prefer mixing it up and creating your own unique style? Popular styles in Singapore include Scandinavian, Industrial, Eclectic, Minimalist, Modern and Contemporary. Bear in mind that trends come and go, but classic designs can stand the test of time so try to avoid choosing a particular style simply because it is the current trend. You will also have to make a choice between choosing contractors and interior designers. If you have a clear vision of the design and do not mind managing various contractors yourself which includes the nitty gritty such as checking if they’re HDB Registered Renovation Contractors, you can hire them directly. This may prove most cost effective as you would not have to pay for the interior designer and you also get your own choice of contractors. Alternatively, you can choose an interior designer, who will help you design your dream home and you’ll only have to deal with a single party. An interior designer may be a better choice if your renovation works are going to be extensive. This article on Qanvast goes into greater depth on the pros and cons between the two choices. Ask friends or go online for recommendations for interior designers or contractors. Do they have good reviews? Ask them questions that will reveal if the designer or contractor is a good hire. These should include questions such as whether he is able to stay within the scope of works, budget and schedule, and work ethics such as punctuality. 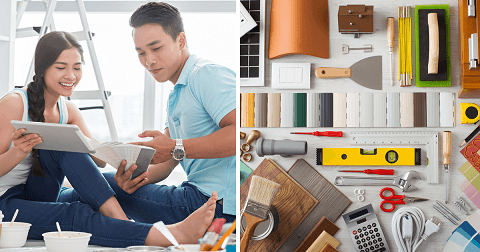 Just like how you would want to buy insurance coverage from the best insurance companies in Singapore, you would want to choose only the most reputable designers and contractors to work on your dream home. IMPORTANT: In making these decisions, do consult your significant other as well as family members who will be staying with you. Explore ideas together for a shared vision of how your dream home will look like. If your tastes differ, perhaps seek third party views (such as from professional interior designers). Remain calm and do not let emotions escalate the discussion into conflicts. Renovation of BTOs typically take about 8 – 10 weeks, and for resale flats 12 – 14 weeks. Keep an eye on the schedule as well to ensure that works are completed on time (but expect to buffer in an extra 50% of the original project duration for slippages – it is better to allow the contractors to do a proper job than to rush them). During renovation works you would want to frequently inspect and make sure that the works are proceeding as you intended as miscommunications can happen (e.g. are the materials and colours what you have chosen? ), and that the quality of the works is up to your expectations (e.g. cracked or uneven tiling, cupboard doors not fitting well, new power sockets not functioning, etc). We wouldn’t advise it, but if you wish to get involved in any of the heavy works yourself, perhaps ensure that you are covered with personal accident insurance? All Done – Home Sweet Home! Once the renovation works are completed, give it a final inspection for flaws or mistakes that might have been missed. If your interior designer or contractors have done a good job, show your appreciation– you’ll never know when you might want to call on them again. If you haven’t done so already, check out the Thank Etiqa its Friday promotions for deals on home insurance and also for your other insurance coverage needs. All done? Last step – call up friends and family and invite them over to admire your freshly minted dream home. It’s time to PARTY!